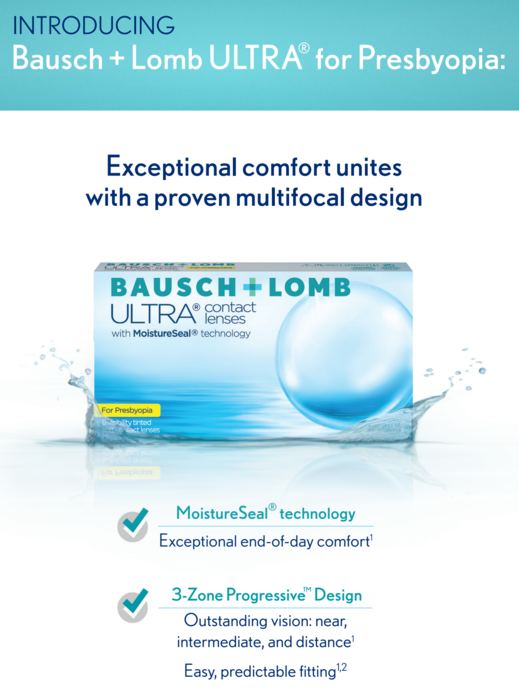 Bausch + Lomb ULTRA® contact lenses for Presbyopia was specifically designed to combine the company’s innovative 3-Zone Progressive™ design, found in Biotrue® ONEday for Presbyopia daily disposable contact lenses, with the excellent end-of-day comfort of Bausch + Lomb ULTRA® contact lenses with MoistureSeal® technology. Blurred vision can result from a condition known as presbyopia, which becomes more prevalent as our eyes age. Presbyopia impacts the eye’s ability to focus and progresses over time. Initially, some people find that they have to hold reading materials farther away to see them clearly, leading to the need to use multifocal spectacles or contact lenses.